ENGLEWOOD, Colo. (AP) — Denver Broncos running back C.J. Anderson is pointing to a possible return during the AFC playoffs after having the meniscus in his right knee repaired. The Broncos are expected to place their leading running back on injured reserve, which would put him out of action a minimum of eight weeks. Anderson had surgery in California on Thursday to repair a torn meniscus in his right knee 72 hours after getting hurt during his best performance of the season. “He’s going to miss some significant time,” coach Gary Kubiak said after Friday’s practice. Kubiak planned to meet with general manager John Elway and head athletic trainer Steve Antonopulos to come up with a timetable for Anderson’s return and a plan for his absence. For now, the Broncos aren’t adding another running back to their roster, although should they decide to bolster their backfield they needn’t look any further than their own practice squad where Juwan Thompson provides both experience and versatility. Rookie Devontae Booker will make his first start Sunday when the Broncos (5-2) host the Chargers (3-4), with Kapri Bibbs backing him up. Kubiak said he liked how both backs looked at practice this week. 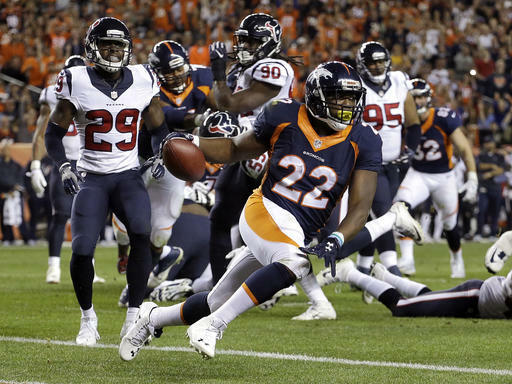 Anderson got hurt on his second carry Monday night but returned to the game and ran 14 more times for 84 yards and a touchdown, finishing with 107 yards on 16 carries in Denver’s 27-9 win over Houston. Booker added 83 yards on 17 carries. The Broncos ran for 190 yards against the Texans and were feeling good about their suddenly surging ground game until Tuesday afternoon when Anderson showed up with a sore right knee. Bibbs said even with Anderson out for a while, the Broncos can still have a powerful 1-2 punch in their backfield. He pointed to the undrafted Anderson, who leads the team with 437 yards rushing and four TDs, as a prime example. The Broncos have plenty of other decisions on their hands aside from running back. Center Matt Paradis (hip), cornerback Aqib Talib (back), linebacker Brandon Marshall (hamstring) and pass rusher DeMarcus Ware (broken right arm) are all listed as questionable for Sunday. The Broncos acquired A.J. Derby from archrival New England this week after getting such middling production from their tight end corps. But Kubiak said second-year pro Jeff Heuerman, who has but two career catches, had a good week of practice. That could complicate plans to get Derby on the field Sunday as hoped. The Broncos gave up a fifth-round pick in 2017 for Derby, a sixth-round selection last year out of Arkansas who was buried on the Patriots’ depth chart behind Rob Gronkowski and Martellus Bennett.